I just got an email today about the double period project put on by Your Wardrobe Unlock'd / Foundations Revealed. Prior to this I've been aware of it and idly thought about those that participated and the dedication that they show to be a part of it -- it's a lot of research, cost, and work. Beyond that, I'd never thought I'd be tempted to actually participate. But...I read the email which detailed this coming year's challenge, which is to create an outfit reflecting or inspired by either the 1812 or 1912 fashions. I then googled the two years and realized that I really love the empire/regency dresses of the early nineteenth century. Those would be the high waistline, puffled sleeves, flowing white muslin embroidered underdresses with an overdress in a contrasting colour and pearl-accented necklines and whatnot. So, while I'm not sure if I'll be taking part in the contest or not...I'm tempted. Tempted enough to set up a new tag for the contest and start planning for it. I may not actually ever enter the contest, but if I do, I'll have some dress-diary entries to support it. If I don't, then I'll have yet another cool costume finished or on its way to being finished. 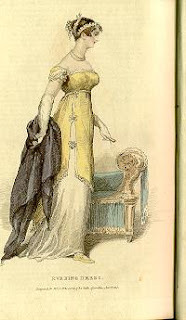 By 1811 in Britain, influence of the Middle Ages, termed Gothic crept into dress styles debasing the pure classical lines. The bodice gained more shaping and could be panelled. It was not cut as tight and narrow as in the first decade of the century, so it made the shoulder line broader and the dress more comfortable to wear. For evening gowns, bodices were low cut in either a square or a V in front. 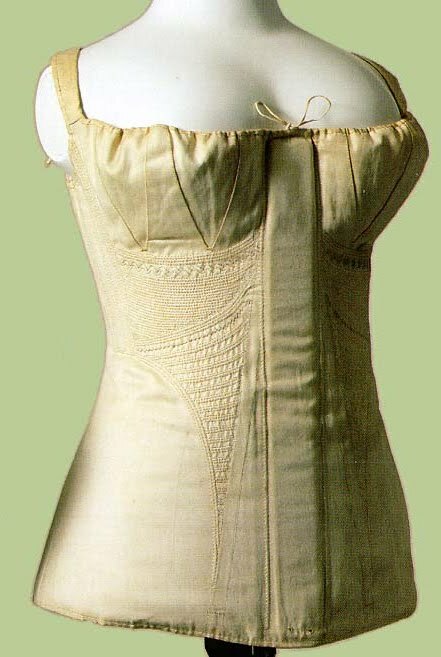 Shoulder straps were uncommon, with the bodice tightly fitting the figure and trimmed with puffing. Colored velvet bodices were often worn over white satin and muslin. Short slashed bishop sleeves were in, but trains were out for this period, unless the woman was in full dress. Accents of buttons on sleeves and mother-of-pearl clasps were used for added adornment. White, of course, and a variety of pastels, but stronger colors were also popular. For example, the Ladies Magazine of 1812 lists salmon, blue, pink, green, red-lilac or heliotrope, buff, grey, crimson, orange, lemon, jonquil and puce as fashionable colors. Patterned fabrics are trickier: the white-on-white embroidered muslins show a variety of trellised vines and flowers, but where a contrasting figure appears (an embroidered flower or woven in design) the pattern is usually a small figure made with few colors, regularly spaced. 1805 to 1810: The front of skirt is now a single rectangular panel set into the bodice with no gathers. The side seam is well to the back, and, as the panel is a rectangle, falls slightly to the front (i.e. it is a straight seam but due to the shape of the skirt it appears to curve.) The side back panels are triangular to provide fullness and all the gathering is in the back. 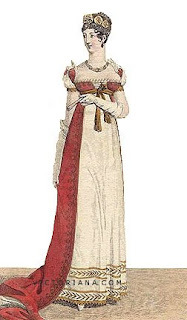 1816: Skirts continue to be cut with a front rectangle, side gores, and gathered back. So that defienitely tells me that the skirt construction for 1812 was smack dab in the middle of the rectangular-front-panel timeline. That'll be something new for me. As will the gathering of the puffed sleeves - set way back on the dress and the gathers are centralized on the shoulderblade, not the shoulder itself. 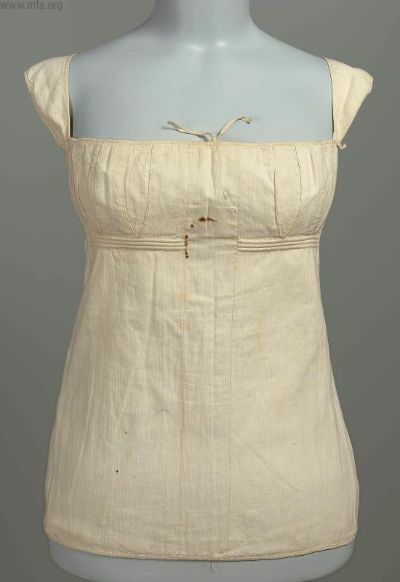 These two pictures are of the undergarments from the period (from the same site as the excerpts above): the first is from 1810 (missing its busk) and the second from 1819. While I suspect that many women would still be wearing their 1810 stays in 1812, there would probably have been slight movement from the former towards the latter, styling-wise. I'll have to keep an eye out for a corset picture that's marked 1812.